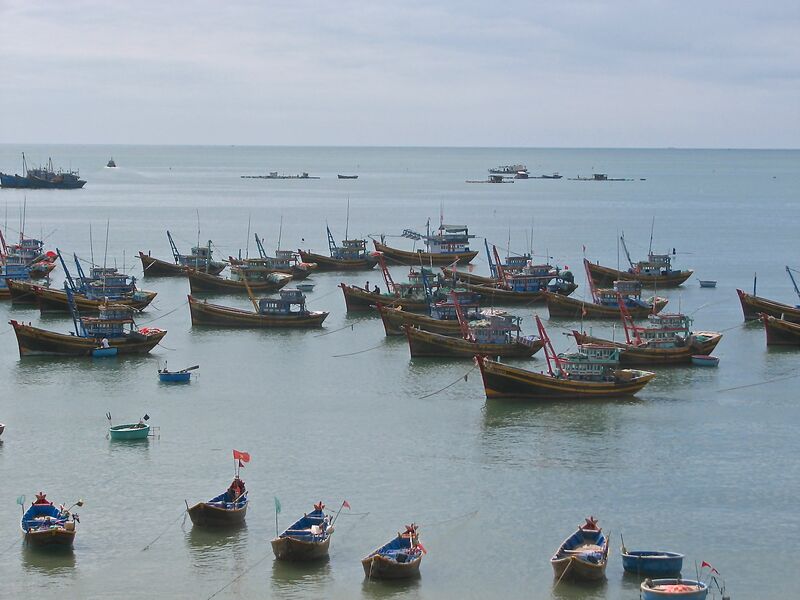 Well another travel day with a short flight to Phu Quoc the island off the south coast of Vietnam. 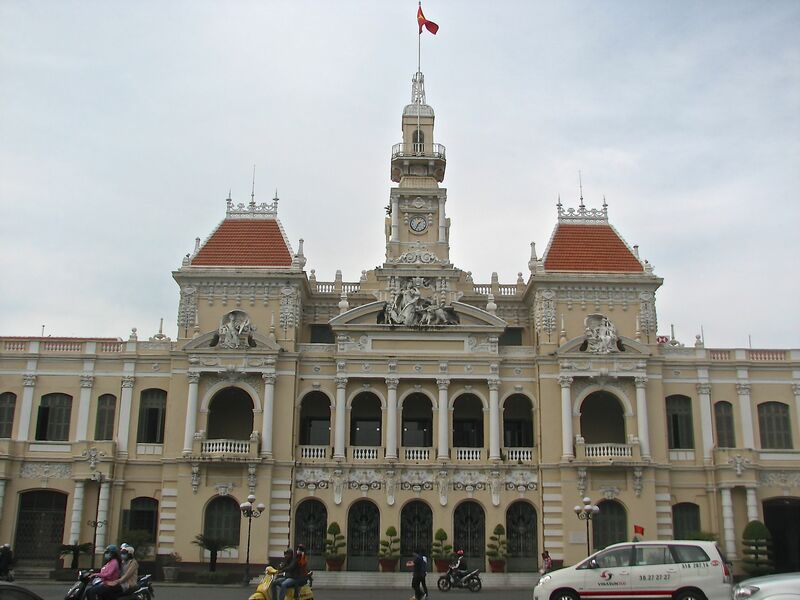 Check out from the Grand hotel included the now usual hold up at Vietnam hotels while they check you haven’t run off with the pillows and sheets. The Grand is somewhat of a misnomer as it is clearly living on past glories. 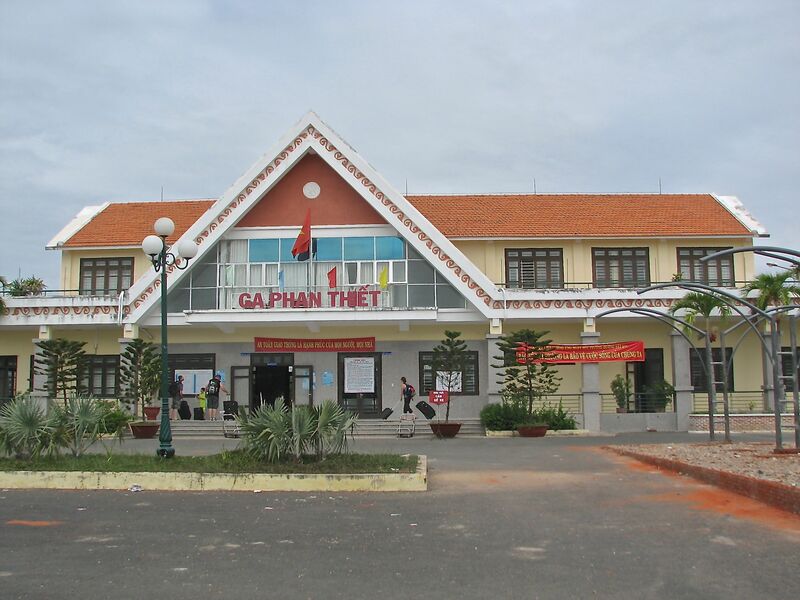 This was the hotel that during the Vietnam war housed most of the war correspondents and each evening at 5 p.m. the Americans briefed the press on how the war was going. The briefings quickly became known as the Fantasy at Five briefing. Apart from three floors of old rooms nothing remains of those days. The hotel is just another high rise of 20 floors. They do however take thieving seriously , so much so that in your room is a price list of everything that is there including the TV, all the bedcovers, the spoons, saucers and cups, the kettle, the desk ,all the lamps and the chairs. Quite how or why you would want the desk only they know but you aren’t released until the security guy reports that everything is still tied down. 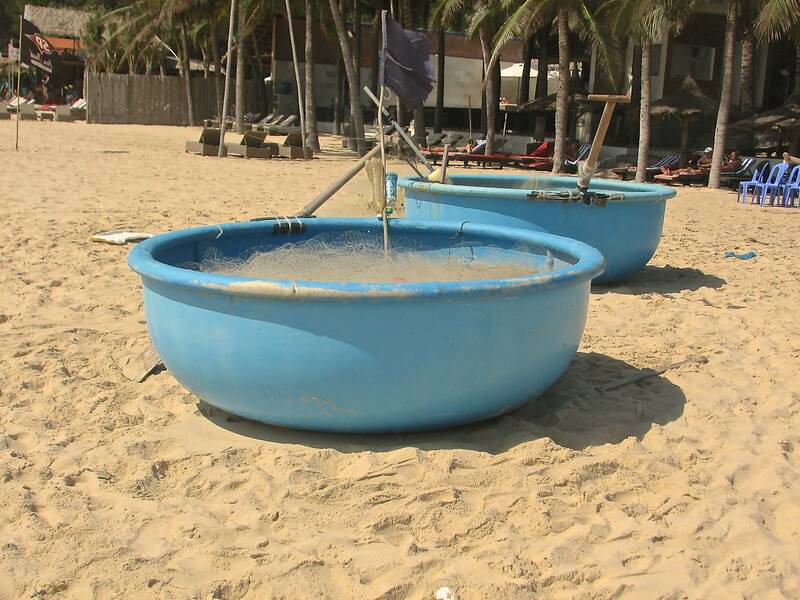 The Villa Aria in Mui Ne did the same thing . Some Americans checking out before us had left their beach towels by the pool and were to be charged for them if they couldn’t go to the pool and find them. They were joking ( they hoped) that they were about to subjected to a cavity search next. I have only come across this before in Delhi, India but it does seem to be becoming more the norm in Asia.The Delhi experience was a little more nasty as they held our passports and took the credit card away until three security guys who were sent to the room returned to the lobby. With check out at noon and an afternoon flight there was time for a little retail therapy before the third degree. Saigon Square 1 and it’s newer cousin Saigon Square 2 cover the clothes, shoes, handbags and all things North Face especially the rucksacks. 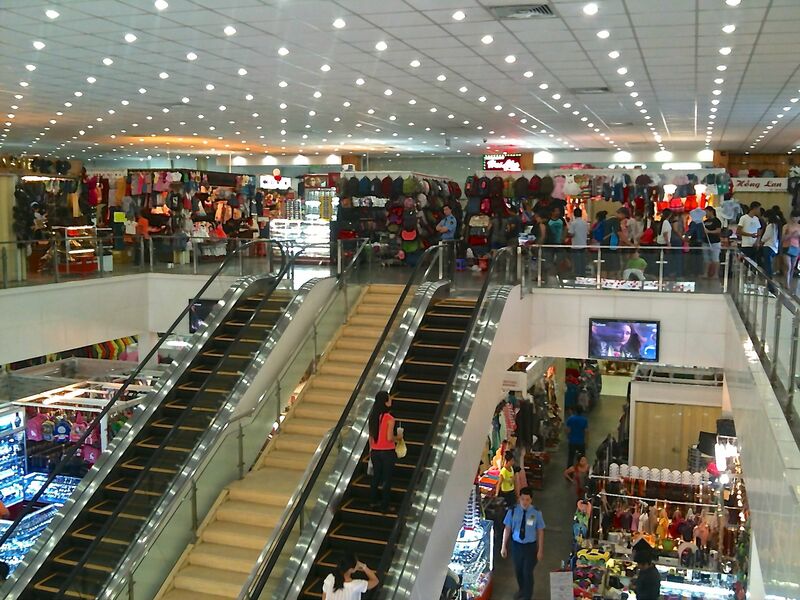 Saigon Square 2 near the Legend hotel is more spacious and you still barter for the stuff even where they say fixed price only. Tons of Zara stuff, loads of Abercrombie and Fitch some fake, some seconds and all cheap before you barter. $40%-50% off is the goal to keep in mind but show no enthusiasm and walk away at least three times and wait to be dragged back. if they don’t hit another stall selling the same stuff. If you want fake paintings go to Tran Phu Street where you can pick up any Old Master you want or they will do one for you. Suitcases are best on Le Laa Street but there are great fakes everywhere and looking at the Kipling bags it would be hard to tell the difference. 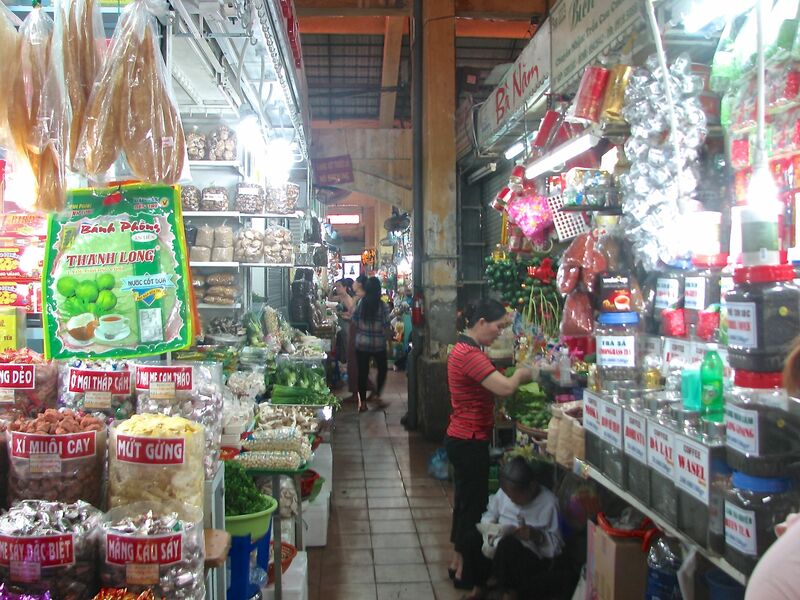 The big old market in Saigon is the Ben Thanh Market. Certainly from the Grand it is an exciting walk as you cross several large roads all with cavalry charging motor bikes coming at you from every direction. There are fashion stalls there packed in like sardines. But it more a real market for locals to shop . and fish stalls , this guy tried to get away by jumping out of his bucket but the owner found it and by now it is probably being served for someone’s lunch. The airport is just 15 minutes from the downtown area and the cab was under £6 including a fee to enter the airport. Check in was surprisingly easy given the reputation Vietnam Airlines seems to have with the on-line community , plenty of staff and they kept opening more check in counters as the crowd grew. Very unlike Air Asia Thailand whose check in agents have discarded the uniform for jeans and seemingly are inputting your entire life history into the computer in triplicate . Within 2 mins that wooden spar was digging into my shoulder and the idea of walking miles trying to sell a few coconuts almost impossible to envisage. I tipped him well. Our son arrived today so we set off around the sights again. It turned out to be quite an eventful morning. Luckily The Reunification Palace is closed on Sunday so once again I was spared crawling through tunnels and the rest of the sights are in easy walking distance of each other. We decided to walk up to the parliament building halfway there a guy on a motor bike parked on the pavement started it as we approached him and began along the pavement. As he came towards us he smiled and we started to smile back. Then as he passed he lent over and grabbed Geraldine’s gold necklace. He clearly hadn’t tackled a girl from County Durham with Yorkshire blood before . People don’t steal things from them. She grabbed the necklace and hung on. He gave up and raced off down the road. She was left with long scratch marks on her neck but still hanging on to the necklace though the clasp broke. Two years ago in Bang Saray in Thailand a couple of guys on a motor bike tried for her handbag. Again she hung on and I hung on to her. The pillion guy faced with falling off let go. They never learn do they. regulars will remember that the Vietnamese for 3 is ba and that the local beer is 333. With three of us at the table for the beer I was finally able to say ba, ba ba ba . Ah the joy ! Not many of you are old enough to remember the singer and disc jockey on Radio Luxembourg Sam Costa but I do. Now in Thailand there used to be a local beer called Koster and three in Thai is pronounced sam so again such delight in asking for …. Little things please little minds, I know. Finally farewell to David Coleman the great BBC commentator who died yesterday. Not many of you will know that he was a life long Wolverhampton Wanderers supporter as I am. The club owes him a big debt of gratitude as in the 1980’s he led the ” Save our Wolves” campaign as the club lurched for financial crisis to financial crisis and looked like going under. He was also famous for his gaffes which Private Eye the satirical magazine termed Colemanballs. One I loved was his remark when covering the 1976 Montreal Olympics: “and there goes Juan Torena down the back straight, opening his legs and showing his class.” and another “That’s the fastest time ever run, but it’s not as fast as the world record.” Classics. 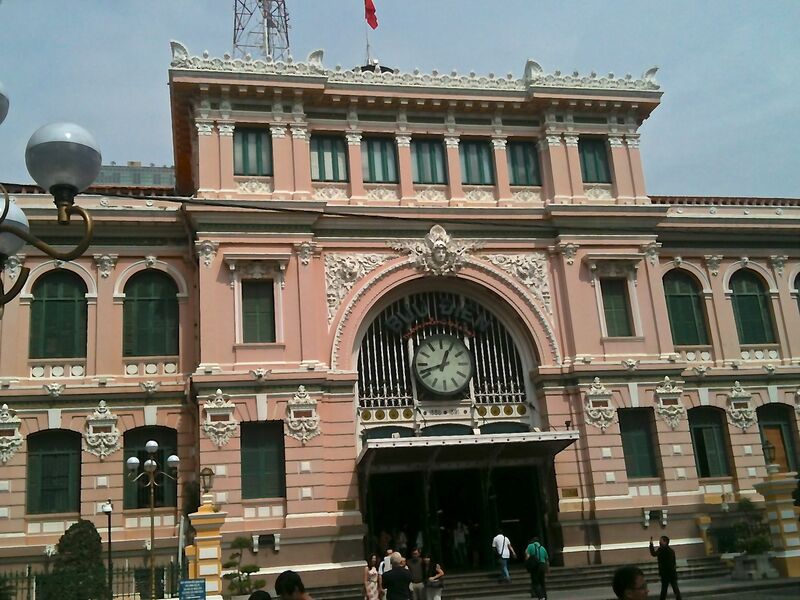 My daughter and son in law have arrived from Hong Kong and took us on a whistle stop trot around the sights of Saigon this morning. I’m not a great sightseer preferring to sit in places and watch the locals but it is good to get out and see parts of the city. Now I don’t know how many people on trips to cities take a picture of a post office, not many, but clearly for some reason the French must have had a thing about building monster ones in their colonies. This one is a rather pleasant ex British Public School boy pink shirt colour don’t you think ? It is huge inside but mainly made up now of stalls selling tourist knick knacks. The youngsters went on to the Reunification Palace where you can crawl into the tunnels used during the war against the USA. I ducked out of this and returned to the hotel. Obviously here understandably the American side of things is not to the fore but as I dozed this afternoon I thought of a few people we have met on this trip . In Mui Ne we met a charming American couple form just outside Anchorage, Alaska in a place called Palmer where they have a B&B. 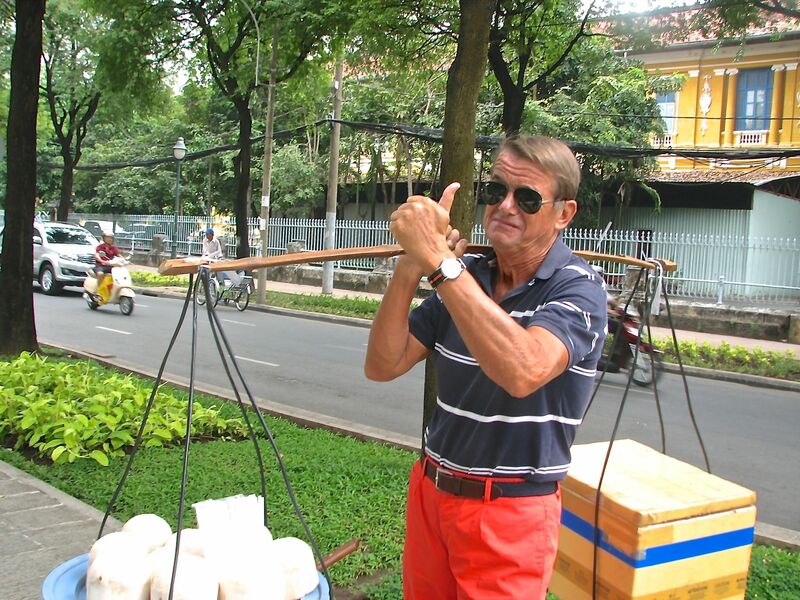 Greg had always wanted to visit Vietnam and this was his trip of a lifetime as he achieved that goal. He told me that his father flew B52s during the Vietnam war . He was based in Louisiana and did tours of duty over here at the height of the bombing campaign. He said his father never ever talked about his experiences nor the war and that he Greg regretted never having made him to open up about a war that so many veterans decided to ignore as did most of the USA. Hence his trip here . Just before the train yesterday pulled out from the station I went to take the photos and met a Vietnamese guy having a last cough and a drag before he was banned from smoking for 4 hours on the train. He told me he was from Dallas, Texas and had returned for the first time since leaving Vietnam 40 years ago. He clearly left with the Americans. 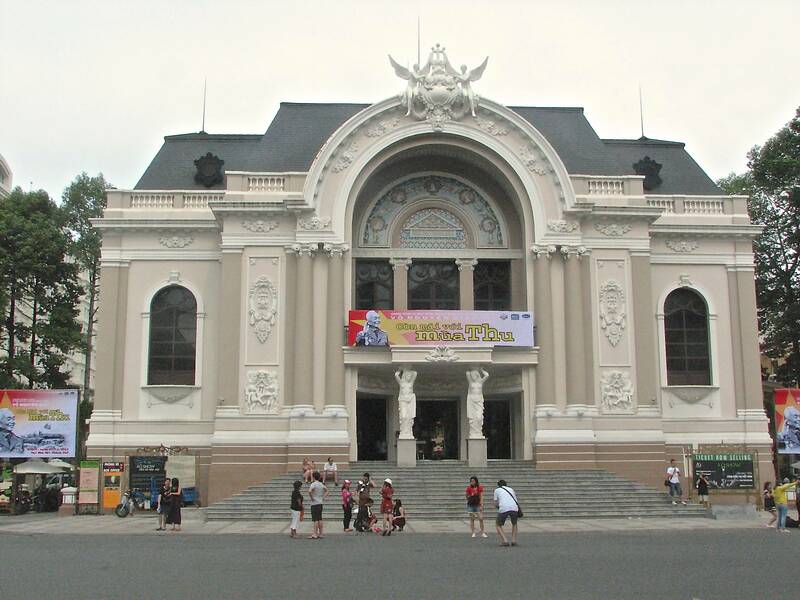 He had originally come from Mui Ne and so was visiting his home town. how did you find it I asked. Full of Soviets he growled at me whilst drawing on his last cigarette . I didn’t like to tell him that that place is no more either and for a few more minutes he went on about how the soviets seem to have taken over the whole area. My experience of the Vietnam war was secondhand apart from a brief frisson of excitement that Harold Wilson the British Prime minister might take Britain into the conflict. Being Royal Naval Reserve at my school we had visions of call up and off to the Far East. Reading Spycatcher by Peter Wright years later the book in which the head of the CIA counter intelligence unit told the ex MI5 author that Wilson was in fact a KGB agent, such a policy decision was clearly unlikely. A friend of mine working at Pan Am in New York was called up in 1969. Luckily he always said because his father was in the US Diplomat Corps he pulled strings to have him placed as liaison with the Australian troops on the ground in Vietnam. His father felt he had a better chance of survival as an officer than with his own American troops ( at least 230 American officers were killed by their own troops, and as many as 1,400 other officers’ deaths could not be explained). A few years later as we sat in his very nice family apartment on Central Park South he told me how he and the Aussies would sit in the jungle and firstly hear the Americans coming with transistor radios etc, then smell them with their cigarette smoke and aftershave and then see them as they walked inches away without seeing the fully camouflaged, odourless, jungle trained Aussies. 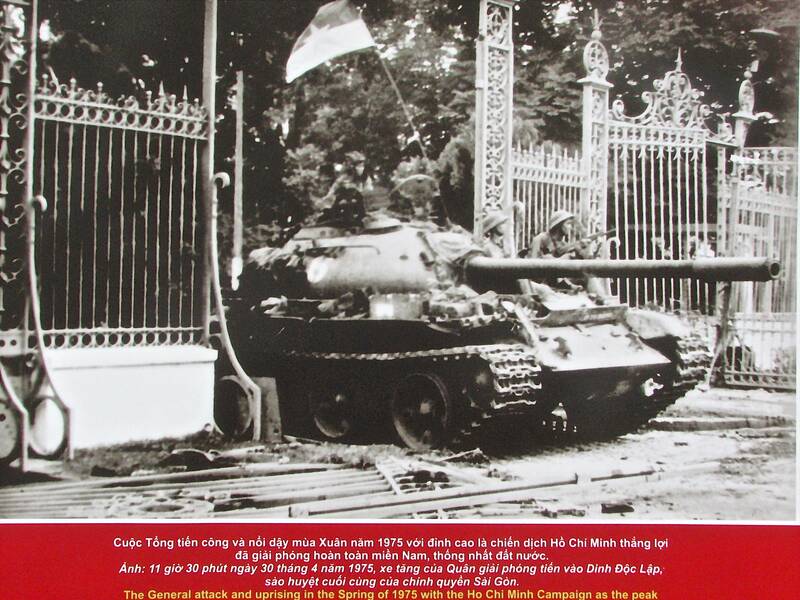 Often sometime later they would find the bodies of the self same troops killed by the Vietcong. He survived 2 years but again in the main he never talked about it. it was of course that great ex communist union boss John Prescott who brought us the M4 bus lane which was in fact a private lane for him and other Ministers in the UK to rush into London from LHR without being held up in traffic . This is a ten carriage train with First Classs, soft seat economy Class and the rather ominousy named hard seat Economy Class. As I write we are fairly rattling along after some rather slow stretches when I felt I could almost have walked along beside it. Maybe it is now downhill into Saigon.. The main stops are to allow other trains to come down the single track route and pass heading south. Some of these are at stations stops on the way most are not. Last night rather than taxi to the bar we walked some way to use the ATM . It led us past a restaurant that we had used about a week ago. It was recommended by a couple staying at the Villa Aria as being ” not too bad” which for restaurants on the main strip is equivalentt to at least 2 Michilin stars as the rest are so poor. 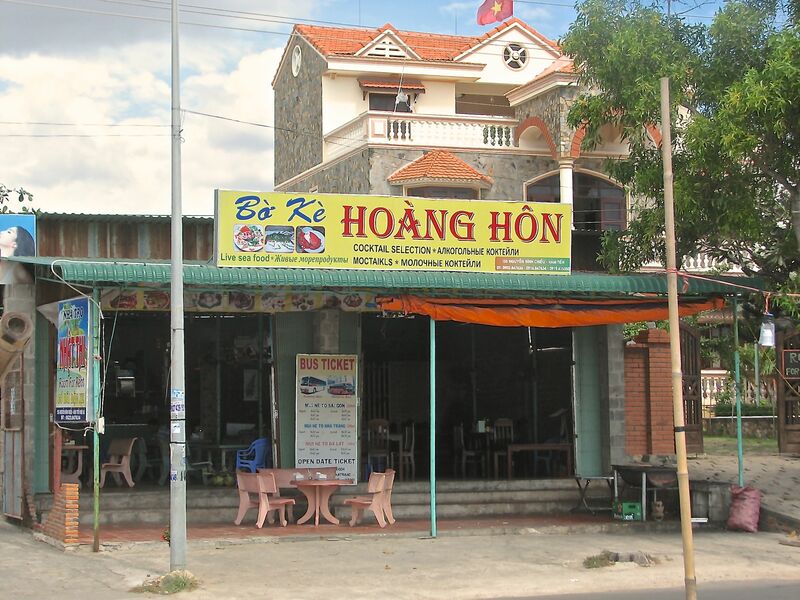 We went in hope of real Vietnamese food and ate probably the worst meal we have had on this trip or any trip. Truly terrible food served in an offhand manner where clearly we were doing them a favour. The restaurant has two girls standing outside and they entice customers in by saying endlessly Hello Madam come in for yummy food. How ever once we had been in they studiously ignored us and they did so again last night. Clearly they knew we had been done and needed to be left alone. Plenty more fish in the sea. I call it the Maltese Tourism theory. Malta is an island in the Mediterranean south of Italy and close to North Africa. Perhaps unkindly many call it the Alcatraz of the Mediterranean. It is a rock in the middle the sea. It boasts just one beach and that is very small , plus a big dockyard and for years it was a place you could go abroad and eat British food because the Royal Navy were there . I went years ago for a visit and after driving from one end to the other in a few minutes ran out of tings to do. I was there with some Travel Agents and at a function thrown by the Tourist Office asked one of the guys there quite how they sold the place . ‘We work on the theory’ he confided in me ‘that as long as world tourism grows by 6% a year there will always be enough tourists traveling and a few of who will come to Malta. Any downturn from that and we are toast of course’. 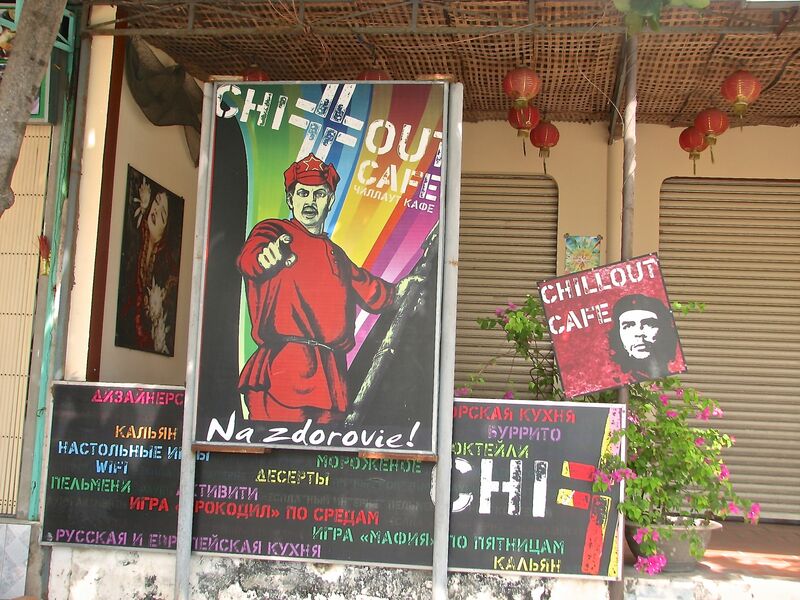 The restaurant in Mui Ne knows that every week there is a massive turnover of tourists. Nobody who has eaten there once would ever come back but who cares. iI is also not worth even talking to the ones that have. Not so silly really. Oh and the train only takes 4 hours not 5 hours as the internet sites say. We arrived at 5.10 p.m. so much faster then by road. All and all a very pleasant and easy experience. Amazingly sitting opposite me was a Vietnamese guy with his family. He smiled a few times and helped me fix the recline on my seat. He even offered me one of his beers. Surprisingly after about an hour he lent over and said in an Aussie drawl ‘ where you from mate’ . He is a miner in Western Australia and comes home for 3 months every couple of years to see his family. He is flying back to Perth on Sunday. He at least didn’t rib me about the Ashes Test Matches. After two weeks here tomorrow morning we say goodbye to Mui Ne and the Villa Aria and head off to the train station to go to Saigon. After the mini bus drive down here we decided to go back on the train. first class is US$15 one way and though it takes 5 hours the same as the road trip everyone says that it it a nicer way to travel . I’ll let you know. So I guess I should do an impressions of blog today . Donald Rumsfeld the U.S. Secretary of Defence under Dubya Bush always used to annoy me with his asking a question of himself and then answering it at press conferences and the like. Unfortunately most politicians have now followed his lead and one of the first was of course Tony Blair. “Did I know the intelligence dossier was sexed up ? Well let me talk through this ” on so on. Of course I will now proceed to do the same ! So like Perkins the answer is goodbye not au revoir . Why ? Well lots of reasons really most of which I have covered on the blogs from here but mainly a feeling that it is all very false. The place has no soul because all that is done here is tourism and the locals very clearly commute in and out each day on the local buses and live their real lives elsewhere. The Villa Aria is a very small hotel in terms of ground size and I’m sure is delightful when occupancy is 60% but full it is a bit of a nightmare and more so when a group of 10 Russians are here. Probably any group would dominate such a small space but given their actual physical size as well they have taken it over. The other guests have retreated to the beach and left them to the pool and breakfast has become a battle ground. Enough said. It has been raining off and on for the last two days and the waves crashing in have been enormous driving the fishermen in their boats further out to sea. 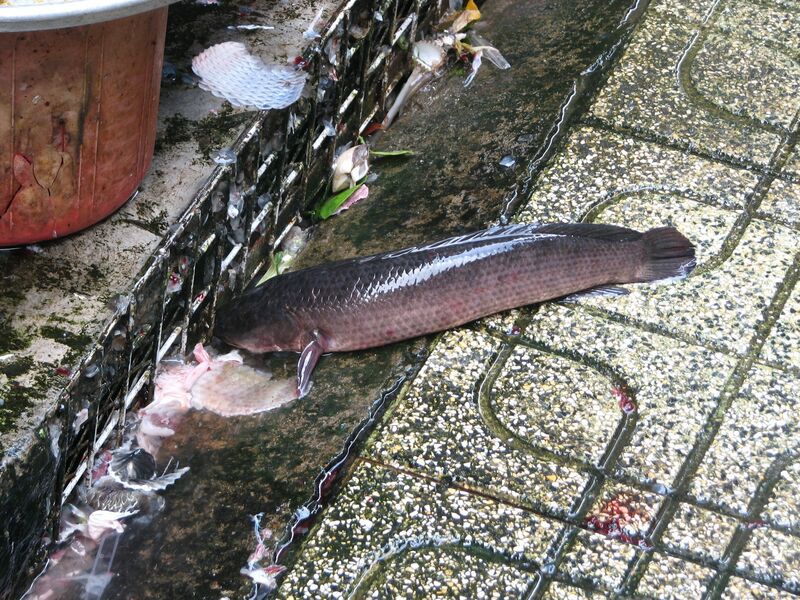 The inshore ones fishing for shrimp have been confined to barracks . this is especially true as they put to sea in what can only be described as circular bath tubs. The paddle is used like a single oar to propel it along . 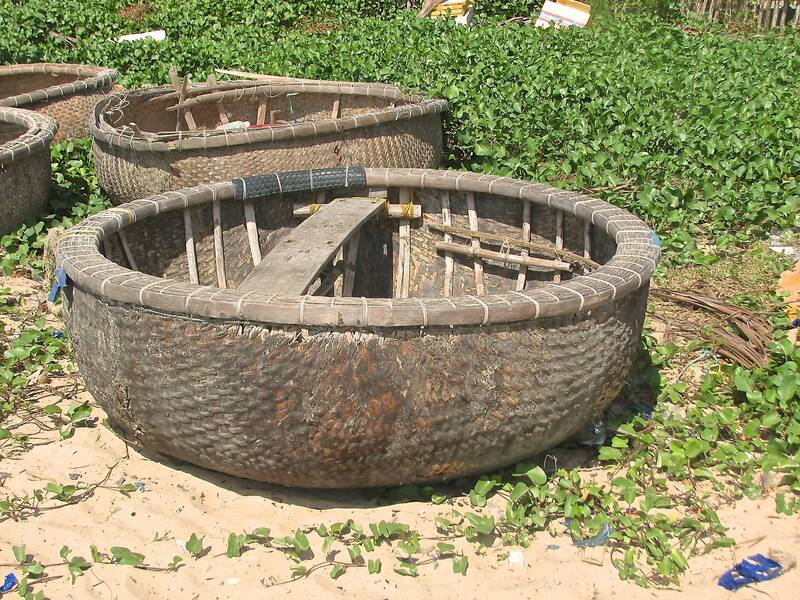 Along the beach are dotted the older version of the plastic bath tub made out of rattan and at the fishing village I went to yesterday these older ones were more in evidence. Now as any self respecting Welshman will tell you these are clearly coracles and indeed they are . Coracles of course were designed to get fishermen and people into low water areas so quite how or why they have ended up here who knows. 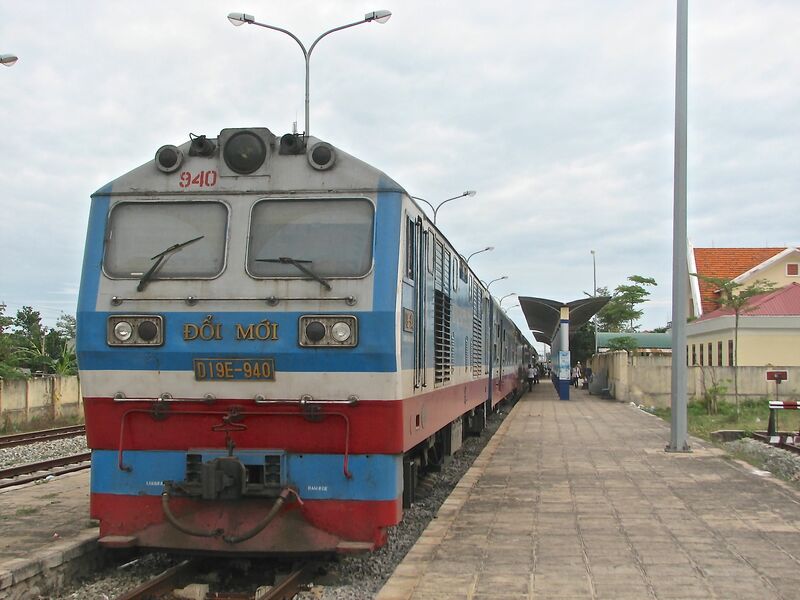 They are found in Mui Ne, in Phan Thiet down the road and up in Nha Trang in Vietnam and in India, Tibet and Iraq or Eyeraq as Donald Rumsfeld would say. They are certainly not made for the swells they have here and hence the lack of fishing the last couple of days. 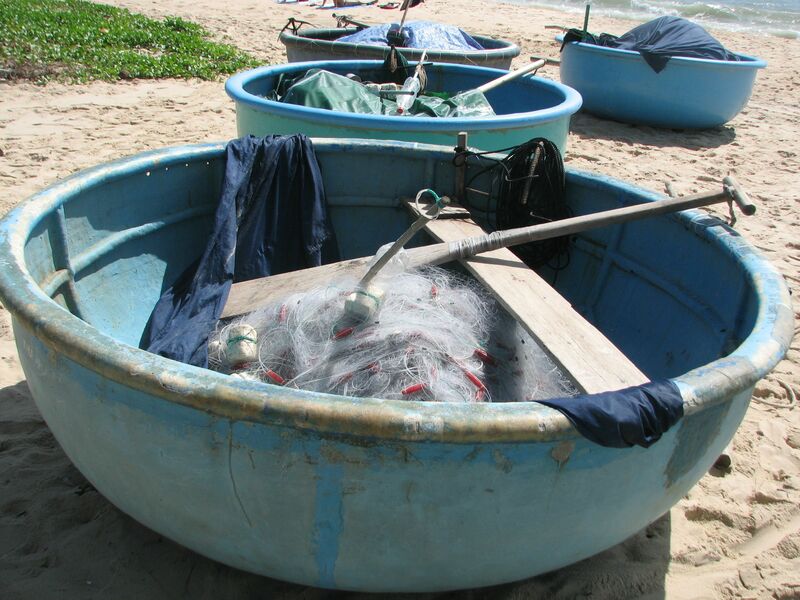 The shrimp they catch are really small and they dry them by the sides of roads and turn them into paste. I am off out to eat several of their much larger cousins helped down by yet more Saigon Green Label. 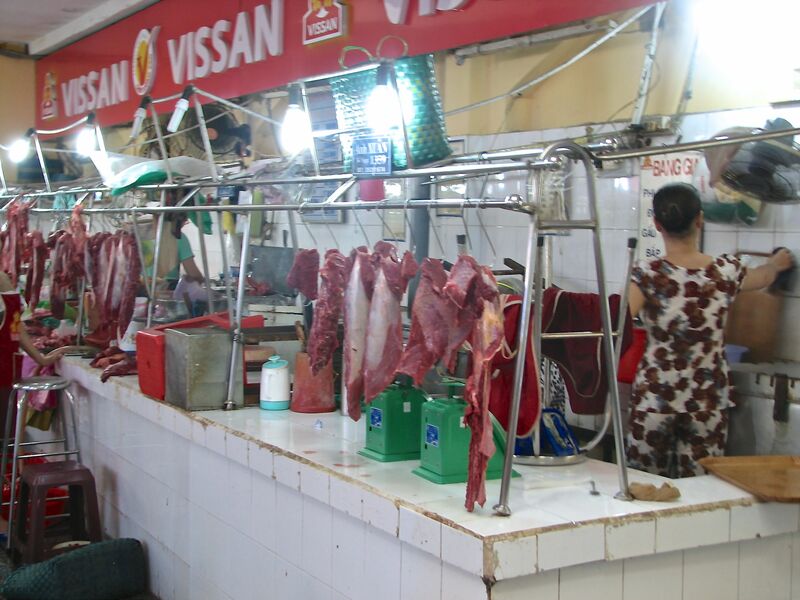 Tomorrow evening I shall be back in Saigon and drinking and eating more cheaply. until then, and seeing as we started with beyond the fringe , I will leave you with Dudley Moore. I had the pleasure of flying one time in the seat alongside his from New York to London on the lunchtime Concorde. Almost Arthur like he said he had the world’s worst hangover and would I join him in a pre take off Bloody Mary having decided to not stick with a promise to himself when he awoke not to drink again. The Concorde landed too late with the time change for me to go to work that day so I did. One led to a few more and I then had a fabulous flight over with an hugely entertaining companion. What a talent he was. Those of you that follow my Puglia blog will know that I went down to the start of one of the stages of the Giro D’Italia bicycle race. I even managed a photo of Bradley Wiggins or Wiggo . Today I tried to emulate him on a ride to the fishing village ten kilometres away. There is one hill between here and there and as I rose from my saddle to start pumping the pedals I thought briefly of him. Four minutes later as I slowly ground to an halt on the incline I rather hoped no one let alone Wiggo was watching. Boy this cycling is hard work. Nothing too salubrious I admit but for me it is home ! They have their priorities right here a coffee with milk is 15,000 dong ( 45 Pence ) and a 400 ml Saigon Green Label is 10,000 dong ( 30 pence ) . 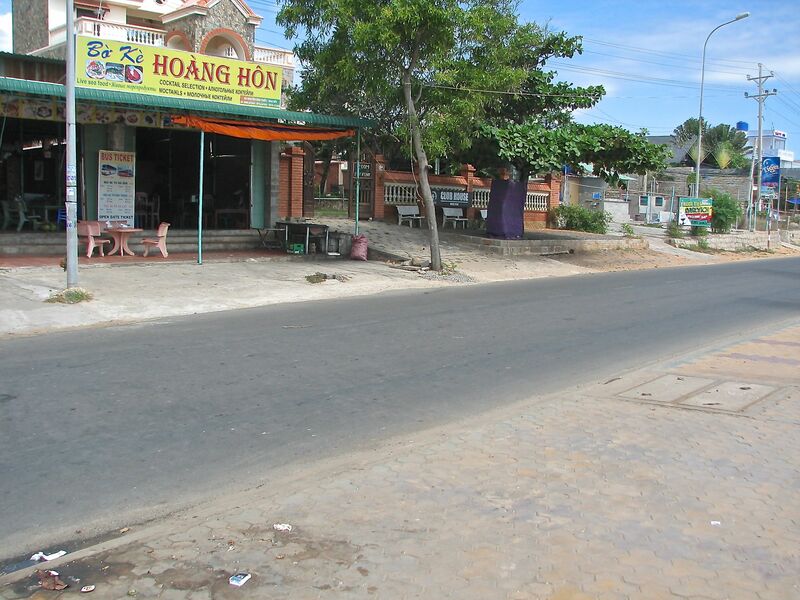 The main road separates the bar from the restaurant which is on the sea front. Okay maybe no the most comfortable of seating but when it’s dark and the waves are crashing in it has a certain ambiance, oh and it’s cheap. Plate of fresh shrimp, big plate of squid, mix veg and a couple of plain rice 135,000 dong ( £4 ) . The seafood is displayed on this side of the road but cooked on the other side so a metal bowl is used to slide the uncooked food one way and the cooked food the other. They wait for a break in the traffic and across it comes over this road. The old Aussie guy Bill ( he is probably younger than me ) seems to hold court there every night and different groups of kite boarders stop by to chat, drink and eat at his table as the evening progresses. Last night he had a couple of French guys and a Pom as well. What is it with people that stand on boards as a sport. It seems they need almost another language to talk. Snow boarders do it where as skiers don’t, kite boarders use the same one though water skiers don’t and the grand daddy of them all surfers started the whole thing off. Bill seems unfazed by all the dude business and just slowly drinks his Tiger beers. The Pom was joined later by another one and after the usual high fives etc and a comparison of shoulder tattoos they got to talking about the Old Country. Both it turned out were in the building game in blighty . Loads of jobs in the UK in construction said one and the other agreed tons of them , hard to know which ones to take. Been busy for a year they both confirmed. Of course in the perverse way of the English workman where had they come during this period of frantic and therefore very lucrative work . Kite boarding in Vietnam. One had come for two weeks and so far been here 5 weeks. Might go back in March guess the boss wonders where I am he said and the other said he was to do the same. I guess no one bothered to tell the Vietnamese owner that things have changed in Russia and maybe this was no longer relevant ! Hey I agree not worth the effort but once there I had to take a photo. There is a bar there (as well as loads of tour buses and taxis for the wuzzies that don’t cycle ) . The bar is crawling with young kids selling fridge magnets of Vietnam and some particularly awful ones of Mui Ne for about 4 times the price they are in the “gift” shops on the strip here. I had never thought about “tat” before I moved to Cyprus where our next door neighbour an English guy told me he was in tat. His company in the Midlands started years ago making tat for “gift” shops in the seaside towns of the UK. The British were keen to take home some memory of their holiday and a wooden plaque with “I was in Exmouth” or Lyme Regis with a tatty thermometer stuck on it that broke almost immediately seemed the ideal thing. As the Brits started to go abroad the company widened its reach and Trevor joined as international sales manger selling “tat” to “gift” shops in Spain, Portugal and the like. It is always in English and follows the style so successful in the UK. He now sells all over the world as the Brits move ever further afield. Clearly the Russians have a similar need as they buy the stuff by the suitcase load to go home. So something we have in common at last and okay I admit I have bought a couple of magnets myself. Well it had to happen didn’t it ? I guess I have been lucky really but it was bound to change. They were actually I think rather embarrassed by the way England have gone so meekly under the cosh and were almost apologising for the way Australia have thrashed us. They were rather delighted to get the England captain out for a golden duck ( sorry North America it’s a cricket term ) out first ball ( you are probably still none the wiser ). After a little jovial Pom bashing which was quite amusing I asked the older guy how long he had been here. He replied 9 years which is quite a long holiday ! 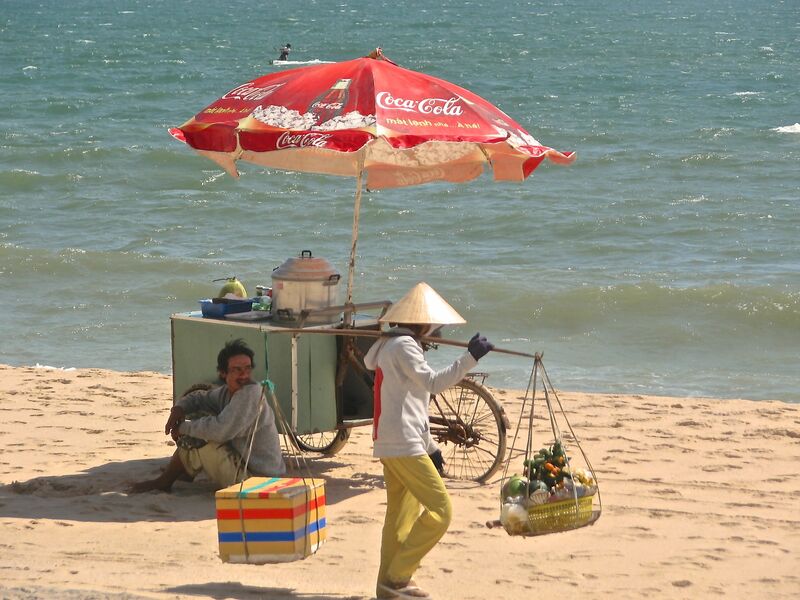 In fact he obviously lives here in Mui Ne and so proved to be a font of knowledge about the place. He told me that when he came here in 2004 there were almost no Russians and very few real hotels. That started to change in 2007 but the Russians coming here were what he called more middle class ones travelling as couples or small families and were both polite and spent money in the town and the hotels. 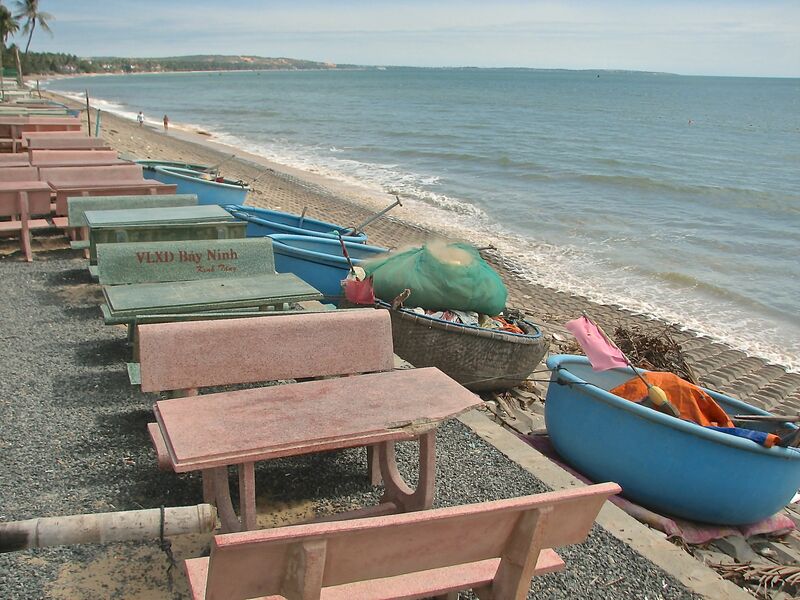 In 2009 a group of Russian developers were told that there was a plan to build an airport at Mui Ne to allow direct flights from Russia and they started buying land and building hotels to meet the expected demand. A tour operator was found to sell the hotels to a much broader mix of Russians. The airport was a myth of course and apparently there are still some huge concrete shells of massive hotels dotted down the coast. Mue Ne itself expanded rapidly and Russians flooded in in droves. 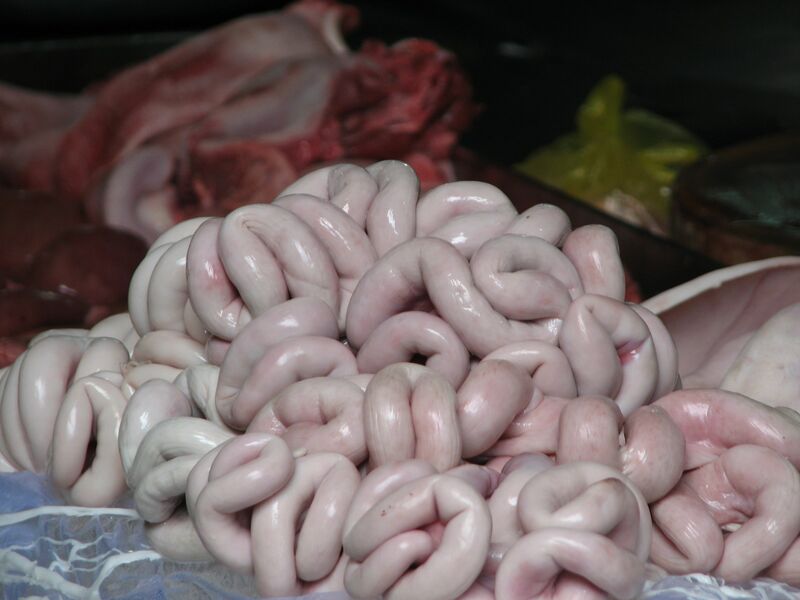 Most could afford the cost of the holiday paid in Roubles but little else. Spending in the restaurants and hotels dropped as numbers grew dramatically. In 2011 the Russian tour operator went bust stranding 400 plus Russians in Mui Ne and leaving all the hotels with no payment. The Russian Embassy paid to take their subjects home. A new tour operator was founded ( aren’t they always) called Pegasus and on the game has gone though some hotels are now more wary about taking Russians in large numbers hence the huge disparity in numbers staying in them. Some are chock a block, some less so and some with almost none. The Villa Aria seems happy to have them in groups even being a place with just 20 rooms. I looked at another small place yesterday called The Mia resort and there were none there at all. So we had a complete history of the place which at least kept the guys off the cricket. I remember my first holiday in Italy which was to Rome in 1957. After a few days sightseeing we took the small hire car to Fregene which them was a small beach resort area near another little fishing village called Fiumacino ( now the site of the main airport ). 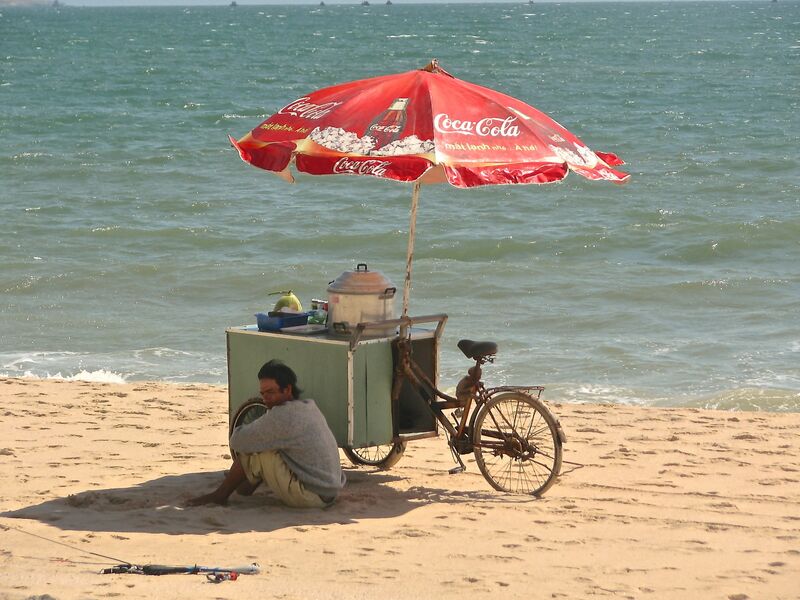 Sitting on the beach there I remember seeing a guy pedal a cart along the beach selling ice cream and Coca Cola. We couldn’t eat the ice cream of course because back then you couldn’t drink the water in Italy and therefore no ice in drinks and no ice cream for us kids. Coke was hugely expensive but he also sold a fizzy orangeade called Pellegrino which was made in Italy and very cheap. Today of course in Rome they are both hugely expensive. However like his Italian counterpart all those years ago this guy also has an eye for a pretty girl as you can see ! I guess the Vietnamese bar owner doesn’t understand the words.